Created with both yield and potency, this Gold Leaf marijuana grow set is the perfect choice for both indoor and outdoor growers. A relatively easy strain to grow, requiring only a small amount of knowledge and experience to produce the highest quality buds and abundant harvests. 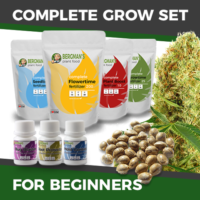 Our recommended collection of grow sets provides the complete solution for growing your own marijuana, containing the seeds, nutrients, additives and all the detailed instructions necessary to producing the finest quality crop. Hand-selected to ensure only the finest, freshest seeds are dispatched to our customers, each seed is sure to germinate, under the I Love Growing Marijuana germination guarantee. Completely feminized, they will produce strong, vibrant plants, with an abundance of high quality buds. Complete nutrient packs ensure your plants are receiving all they require at each stage of their life-cycle. From large doses of nitrogen during the vegetative and growth stages, to phosphorous and magnesium during the later stages of flowering. With all the help and support you may need from germination to harvest, it’s easy to produce a successful harvest. Download the free Growing Marijuana Guide to learn more, covering all aspects of growing, from correct germination methods through to harvesting, drying and curing techniques. Each purchase contains all you need to produce a high quality crop. Twenty feminized Gold Leaf seeds, a complete range of feeds, covering every stage of the plants development, and all three of our recommended Plant Protectors, keeping many of the common problems at bay, and helping ensure that your plants remain vibrant, strong and healthy through to harvest. 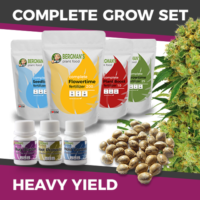 You can buy the Gold Leaf Marijuana Seeds Complete Set, containing the seeds, nutrients and plant protection needed to produce a successful crop here. Take the guesswork out of growing marijuana, with all the help, advice and assistance you may need. Supplied directly from I Love Growing Marijuana, one of the leaders in supplying fresh, high quality cannabis and marijuana seeds, enjoy secure payment facilities, free delivery, and the best stealth postage and packaging methods available, ensuring each and every purchase is guaranteed to arrive under the I Love Growing Marijuana delivery promise. Enjoyed by both recreational and medical marijuana users alike, Gold Leaf marijuana is a 60/40 Sativa – Indica hybrid, containing high levels of both THC and CBD. Often prescribed for sufferers of insomnia, anxiety and stress. It’s easy-to-grow nature makes it a perfect choice with both novice and experienced growers alike. While it’s ability to perform well under almost any suitable conditions, makes it a favorite with both indoor and outdoor growers. Requiring as little as 63 days to fully mature when grown indoors, and with a staggering 21% THC content, Gold Leaf marijuana seeds are a consistent best seller, offering a quality crop and abundant harvest every-time. Marijuana is a relatively easy plant to cultivate, once the seeds have germinated, plant them a couple of centimeters deep, in good quality soil, and they will quickly grow. A regular supply of water and fresh air is vital for growth, as are a selection of nutrients and minerals in varying quantities during the plants life-cycle. All our marijuana seed grow sets contain the complete Bergman’s Plant Food collection, with four different packets of compound, for varying stages of the plants development. Supplied as a dry powder, simply add water to the required amount and apply regularly for the biggest, highest quality harvests. Supplied with all the instructions necessary, and a complete feeding schedule, you will transition from one fertilizer pack to another as your plants develop. Remove the guesswork from growing marijuana and supply each of your plants the best quality nutrients, in the right quantities, at the right time. Contains all the feeds necessary to grow a complete crop of twenty plants. Both indoor and outdoor grown marijuana plants can suffer from a range of conditions that can seriously affect to overall quality and quantity achieved from your crop. Root rot, bud mold and attacks from bugs, such as spider mites, can all have devastating effects. 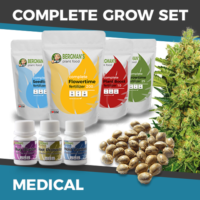 To combat these common problems, each complete Marijuana Seed Grow Set contains three specially designed formulas to help your plants fight-off any attacks or diseases. Protecting them throughout each stage of their development. Supplied with complete instructions, and used in conjunction with each other, the three plant protectors ensure your plants remain healthy, strong and vibrant, from seedling through to harvest. Combined with the supplied feeding compounds, you’ll be giving your plants the very best means of producing outstanding, high quality buds and heavy harvests.